As was found via Elia’s blog, this photography project called My Potholes is pretty hilarious. Basically, in a quest to “re-invent” the annoying pothole in a creative way, the photographers drove around Montreal, NYC, and Los Angeles, looking for potholes to set up a shoot in. 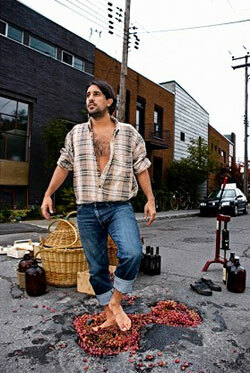 The results were great, especially one of our favorites of a modern take on the anachronistic foot crush for wine. Quite a fun project. Take a look when you get a chance.